The Iron Orcs have turned these ruins into the primary stronghold for their chieftain, Braadoth, the Ophidian Exarch of Undulating Destruction. 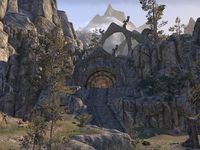 Exarch's Stronghold is a Nordic ruin in Upper Craglorn containing Iron Orcs. It is located in the Valley of Scars. It contains two boss fights, which you need to complete to clear the location: the troll Grothuska and his Iron Orc Fire Shaman guardian; and Ordooth the Corruptor. Two quest-related boss fights also take place here. 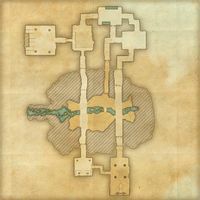 Agganor is found here and must be killed during the quest Iron and Scales. As part of the quest The Serpent's Fang, you will gain access to a locked throne room containing Exarch Braadoth, the leader of the Iron Orcs, and his nirncrux-infused troll Kurzoth. Prior to Update 12, this location was an instanced 4-player Group Delve. Notably, there were two Iron Orc Fire Shamans guarding Grothuska when the location was a Group Delve. This page was last modified on 12 June 2018, at 04:04.